Fifth Scrap-a-Palooza rocks in so many ways! I'm going to let these photos help me tell the story of the best mega-crop in the world...or at least in Springfield, Missouri! 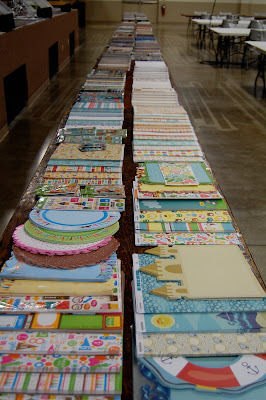 Scrap-a-Palooza is a joint effort of Scrapbook Generation and the Midwest Family Broadcast Group, and our summer event was the biggest ever. 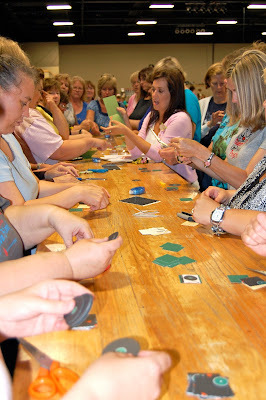 The June Scrap-a-Palooza was a sold-out event with 250 scrapbookers attending! Remington's is the perfect place for a mega-crop...lots of room for all those scrapbooking supplies everyone brings, and lots of room for the huge store we set up on-site. We added new racks this year so that we were able to bring more products than ever before. 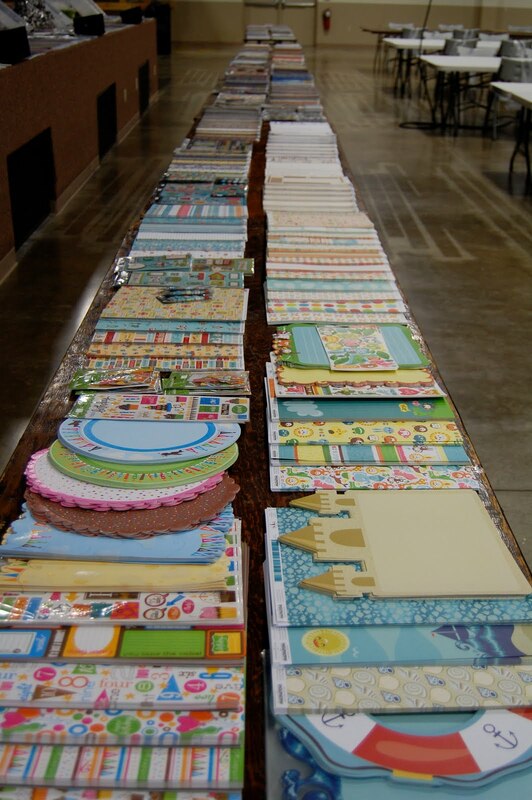 There were almost 60 new paper collections at Scrap-a-Palooza. The line started forming at 6:45 in the morning for those who were intent on being the first to pick out their spot for the day. 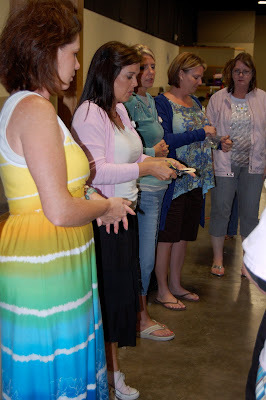 There were four free mini-classes during the day, hosted and taught by Nikki Sivils of Nikki Sivils, Scrapbooker, and her local Design Team (leader Katrina Hunt, Karen Taylor, Laura Parks, and our own Stacey Atchley). 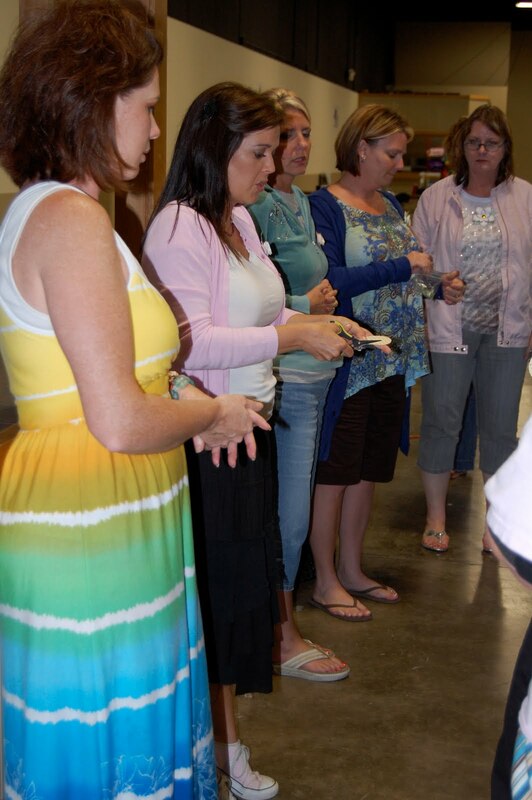 At each of the four classes, 50 ladies were able to participate. The projects were so cute: Dan the Record Man card, Ellie's Day Out flower corsage, Will He Be the 1 treat bag, and stamped and layered flowers. Stacey and her husband Jeremy kept the registers going all day long, and shopping is so much more pleasant now that we have two check-out centers available. Some people run a tab all day, others pay as they go. It's all fine with us! Five times during the day, we call five people up to our area, and they try for a chance to win all the prizes we've managed to jam in our treasure chest. Even the "losers" win a prize from Scrapbook Generation. And we had additional prizes for three other lucky ladies, because the staff from Jillibean Soup called us up and asked if we wanted some door prizes from them! They sent three huge prize packages, and it was a wonderful addition to the event. Allison Davis plays a huge role in making Palooza unlike any other mega-crop. She does three demonstrations via the big screens. For one, she showed many ways to use the fun new product Memory Thread, for another, Shimmerz paint and Perfect Pearls pigment powders. My favorite is "Super Sketches," where she shows one of the sketches from our Sketches for Scrapbooking series, and five layouts she has created. It's so interesting to see her creative process as she tells us how she alters the sketches for different looks each time. Allison also used the big-screen to teach everyone a free class, a 12x12 layout with supplies donated by SG. I don't know if you can see from these photos, but the staff at Remington's has gone out of their way to make this a comfortable place for scrapbookers. Starting with the January event, we now have electrical outlets dropped down from the ceiling every few tables so that almost every cropper has access to electricity for their Cricuts and other items. And speaking of electricity, we had a brief (3-4 minutes) outage following the huge rainstorm that went through Springfield that afternoon. I knew it was a congenial, pleasant group when not one person complained when the lights went out...most people just kept right on working, and we all breathed a sigh of relief when the lights came back on quickly! During the day, Allison taught three paid classes in a separate classroom area. The Nikki Sivils, Scrapbooker group...DT member Laura Parks, DT member Karen Taylor, DT member Stacey Atchley, company owner and designer Nikki Sivils, DT leader Katrina Hunt, graphic designer Heather Schroeder. With a crowd gathered round, Nikki Sivils teaches the Dan the Record Man card mini-class using papers inspired by her husband, Dan! Katrina Hunt teaches the stamped and layered flower class, designed by Karen Taylor. Stacey Atchley, Nikki Sivils, Heather Schroeder, and Laura Parks help with the Ellie's Day Out flower corsage mini-class. The combined teams of Scrapbook Generation and Nikki Sivils, Scrapbooker, both Springfield success stories! Watch for us to collaborate again in a couple of weeks as SG hosts the world premiere of two of Nikki's latest collections. We'll be the first to showcase these groups that won't be seen outside of CHA in Chicago, except at Scrapbook Generation. The Scrapbook Generation gals...Allison Davis, Stacey Atchley, myself, and Karin Vacha. Karin gets double duty on Palooza day. She helps get everyone seated, then heads over to SG to hold down the fort there. After the store closes for the day, she heads back to Remington's to join the rest of us. Can you believe that we have the store torn down and loaded up by 11:15? And I can't forget Jeremy, who is a huge help setting up the store on Friday and then breaking it down again at the end of the evening on Saturday. We want to thank all of you for the continued support of our signature event, Scrap-a-Palooza. It's a huge undertaking, but we take great pride in bringing you the best the scrapbooking world has to offer. And we'll do it all again on Saturday, September 25! See you there. minute! It was a great day for being with good friends and making new ones! I even ran into an old friend that I hadn't seen for probably 30 years. Can't wait for the next one! Love all your photos from this amazing day. Wish so badly that I could be there. Congratulations on having your biggest and bestest Palooza yet. It looks like it was a great day for everyone! !